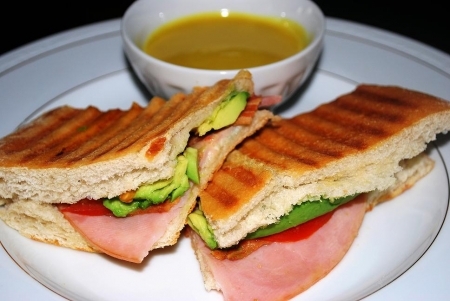 Panini’s are a wonderful sandwich that can be made several different ways. This style features ingredients normally found in a club sandwich or even a cob salad for that matter. You could leave out the Gorgonzola cheese and add a Blue Cheese dressing for dipping. Also, the Gorgonzola cheese can be replaced with Blue Cheese. Make sure the Blue Cheese is on the creamy side so it will melt well. Mix it up your way! The ingredient amounts will make one sandwich and can be doubled, tripled, quadrupled or more depending on how many people are being served. Layer ham, bacon, Gorgonzola cheese, tomatoes and avocado on bread. Brush bottom and top outside pieces of bread with olive oil and cook on a preheated Panini grill for about 3-4 minutes. Serve with a side of honey mustard dressing for dipping.